• Displacement – 13550 tons. • Length – 5051/2 feet. • Beam – 731/2 feet. • Two masts each fitted with searchlight platforms. • Two sets of four cylinder inverted, vertical, triple expansion engines . • 23500 internal horsepower at 135 revs. • 19 Yarrow water tube boilers and 6 cylindrical boilers, each with sprayers to enable oil burning. • 2050 tons of bunkered coal as main fuel. • 600 tons of fuel oil and 30 tons of “patent fuel” ( solidified fuel oil) for emergencies. • 6 inch armour plate midships tapering to 4 inch plate forward and 3 inch plate aft. • 1 inch armour on the upper deck, 13/4 inch armour on the main deck and 2 inch armour on the lower deck. • Main armament: 6 x 9.2 inch guns with one each on the quarterdeck, forecastle and at each corner of the midships citadel. All the 9.2 inch guns were in 6 inch armoured barbettes. • Secondary armament: 4x 7.5 inch guns in armoured barbettes – two guns on each side. 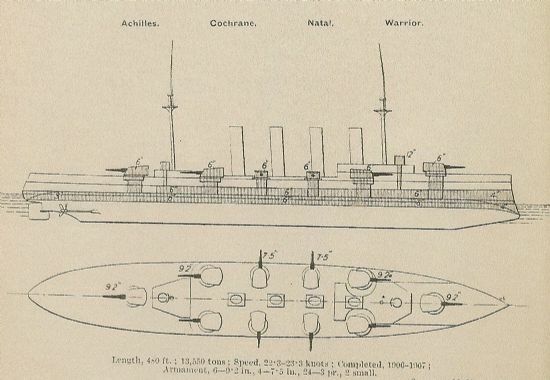 • Broadside was therefore, 4x9.2 inch guns and 2 x 7.5 inch guns. • Ammunition fed to the main and secondary guns by hydraulic and hand hoists. • Other weapons: 24 x 3 pounder QF guns and 5 x .303 maxim guns. • Two beam 14 inch torpedo tubes and one stern torpedo tube with 20 torpedoes carried.